Ownership Status: Emmerson Resources has now increased its interest to 80% of the Joint Venture by completing the Stage 2 Farm-In. In 2016, Emmerson entered into a Joint Venture with Aurelia Metals (ASX:AMI), over their Kadungle project in NSW. Historical drilling by Aurelia indicated potential for both shallow gold-silver and deeper, copper-gold mineralisation – within a region that Emmerson considered highly prospective for multiple deposits of porphyry copper and gold. Emmerson has subsequently earnt an 80% interest through meeting the terms of the earn-in expenditures. 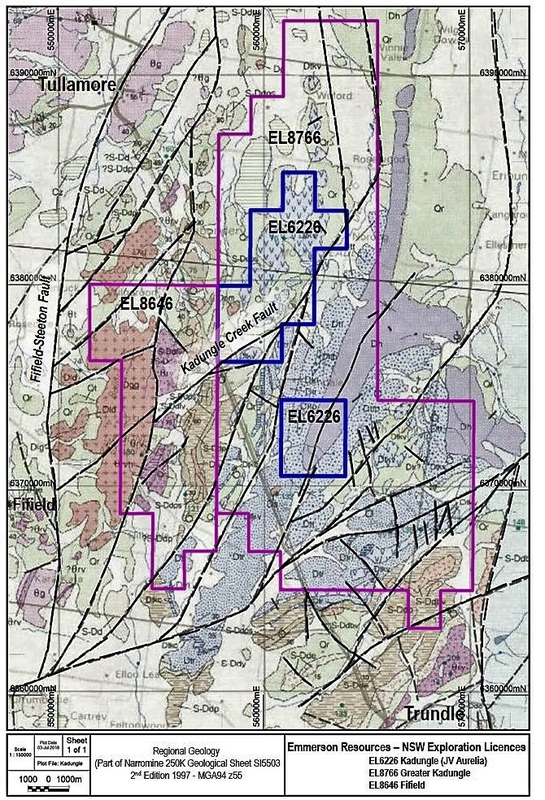 The Kadungle project is situated adjacent to Emmerson’s Fifield project and consolidates a large package of ground within the prospective Lachlan Transfer Zone. The oldest rocks outcropping in the vicinity of Kadungle and Fifield are the Ordovician to Early Silurian Girilambone Group. These rocks are deformed basement consisting of quartzite, phyllite and schist. The Girilambone Group outcrops in the extreme west of the Exploration Lease (EL) 6226 and EL8646, where several strong magnetic, platinum bearing, ultramafic complexes intrude (Figure 1). East of Tullamore and the Gobondery Granite, the basement is less deformed, separated by the north-south Fifield-Steetone fault system. Further to the east, the basement comprises Early Ordovician Nelungaloo Volcanics and the overlying, more widespread Late Ordovician, trachyandesitic Goonumbla Volcanics. Regional Geologic setting for EL6226 Kundungle Project (JV with Aurelia) and adjacent EL8464(Fifield) and new EL8766 (new tenement). The Ordovician Raggatt Volcanics outcrop on the eastern contact of the Gobondery Granite and inside EL8646. Age dating of two intrusive samples collected by Emmerson Resources (2017) confirm the Ordovician age of the Raggatt Volcanics, with dates ranging from Middle to Late Ordovician to Early Silurian. Preliminary age dating of intrusive outcrops, with chlorite-magnetite alteration yielded Early Ordovician to Early Silurian ages (465.3 ± 6.5 Ma and 439 ±11 Ma; zircon U-Pb – UTAS-CODES). The age dates suggest that Raggatt Volcanics are probably coeval and comagmatic with the Goonumbla Volcanics. EL6226 covers part of the Siluro-Devonian Tullamore Syncline. The license area is dominated by the Devonian age, Kadungle Volcanics. Unconformably overlying this sequence are Late Devonian, quartz rich sandstones of the Hervey Group. The Raggatt Volcanics form the basement to the project area and are interpreted as rifted equivalents to the Goonumbla Volcanics that host the North Parkes porphyry copper deposits. The Kadungle Volcanics host numerous prospects including Mount Leadley, Mount Leadley South (Au, Cu), Mount Leadley Trig (Au-Cu), Kilmarnock (Au), Nulgara Hill (Au), Alpha Zone (Au-Pb-Zn) and the Kidney Zone (Pb-Zn) (Figure 2). The alteration zonation in this drill hole (KDD015) consists of upper level quartz-pyrite-hematite grading to chlorite-epidote-quartz and deeper K-feldspar-chlorite-hematite, consistent with an underlying porphyry copper-gold system (Figures 2 and 3). Around 300m southwest from KDD015, Emmerson drilled KDD017 and intersected similar styles of mineralization, with grades of 3m @ 0.67 g/t Au from 299m, incl. 1m @ 1.30 g/t Au from 300m and 10m @ 0.35 % Cu from 475m, incl. 1m @ 1.63 % Cu from 476m. Some 2km north is the Trig prospect where high level epithermal banded quartz-hematite veins and breccia outcrop. Rock chips from the Trig prospect returned anomalous gold of up to 1.1 g/t Au. Plan showing the JV area with Aurelia (EL6226, blue polygon) and known mineral occurrences inside the tenement and surrounds. Grey background is the magnetic image (TMI). Inset figure (yellow polygon) shows ERM drilling (KDD015 and KDD017) including historical intersections. Light blue outlines possible zones of magnetite destruction and associated hydrothermal alteration. Cross section of the interpreted geology from Emmerson’s recent drilling. Note the extensive chalcopyrite-pyrite and quartz-pyrite zones plus hydrothermal breccia at the margin of the volcanic breccia/diatreme. For reference, the red dots are historic intersections projected onto this section. 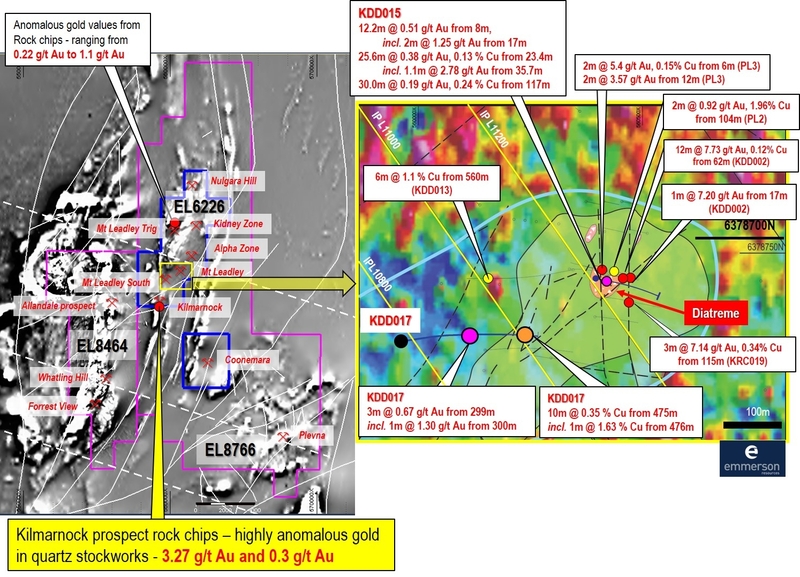 KADD015 and KDD017 is shown with significant gold and copper intersections. The second phase of exploration was completed in February 2018 and since then, further sampling, mapping and geoscientific studies continue. With the aim to pinpoint the better copper and gold mineralisation, typically associated with the core of the porphyry system (figure 3). 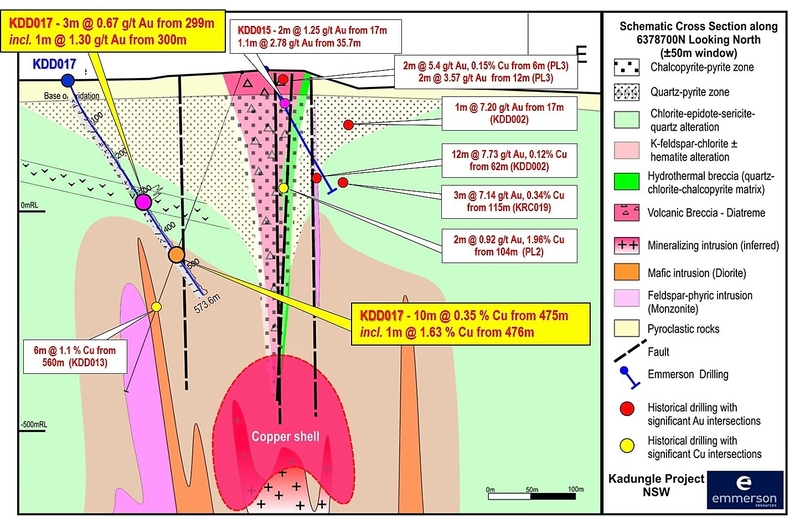 Interestingly, ongoing analysis of the alteration (green rock studies) at the University of Tasmania has confirmed the size potential of the Kadungle porphyry system but suggests that drilling to date has only tested the periphery of the mineralisation.